Plate presentation display holder for hanging plates on a wall. There are two spanners, two hooks, and a spring. For hanging smaller plates, just use the two spanners and spring (shorten the spring if necessary.) Larger plates will need both spanners and both hooks (lengthen spring with wire if needed.) Hooks can be bent as needed. Comes in a blister pack, instructions on package. Quality is good; made of solid brass; spring is steel. 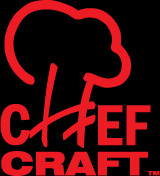 Made in China for Chef Craft. Measurements: the brass spanners are 3-1/4" wide.